The Mod Coder Pack (MCP) is a little suite of scripts and tools that can be used to decompile and modify Minecraft. I have used this toolkit a few times myself to find out how certain things are rendered in Minecraft and to experiment with some modding for fun and profit. The MCP is essential for many Minecraft modders, but sometimes it can take months for it to be updated to support the latest Minecraft version. There are beta releases of MCP with partial support for newer versions, but the beta releases can be hard to find. None of those links list beta releases. The mythical MCP 9.03 RC1 version is presumably to be found on twitter. 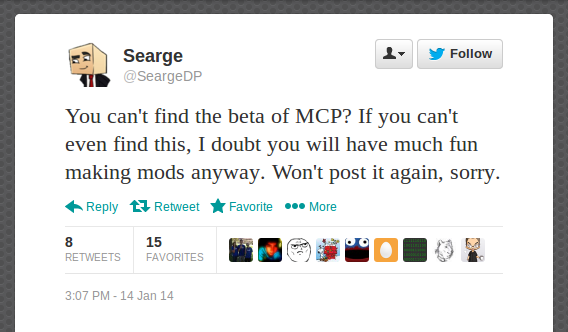 The referenced twitter account is the personal account of the main MCP dev. If you want to find the latest release on his twitter feed you may have to scroll though a couple of weeks of uninteresting tweets until you find a download link. From his twitter I learned that I would prefer to not read his tweets, and that a worryingly small percentage of his tweets talk about MCP releases. So essentially it is made difficult by design. Obviously if you have no desire to search through their twitter feed for a relevant tweet then you have no business coding Minecraft mods to begin with! It makes me wonder why they don’t just stop releasing beta versions altogether. Surely that would keep the riff-raff out! Anyway, being the riff-raff that I am I decided to write a small Python bot which pulls their tweets and scrapes out MCP download links so that I don’t have to. You can use it too, if you want to!